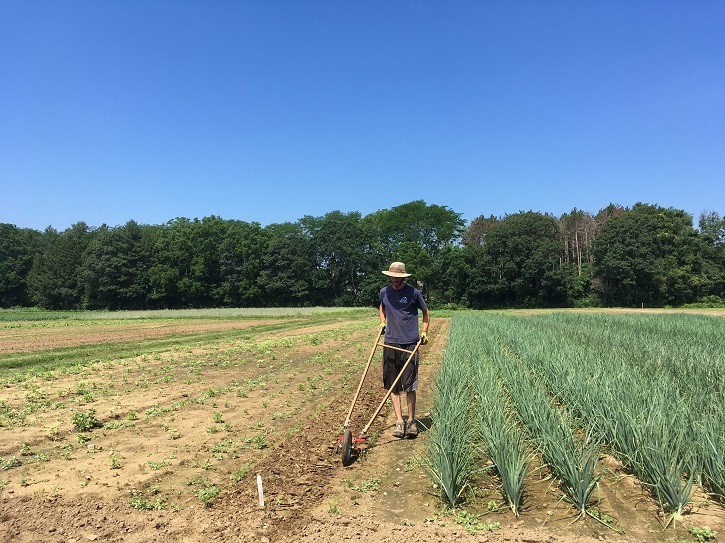 Posted on August 16, 2018 by Kelly M.
Drumlin Farm is a lively and active place, filled with big and small jobs throughout the farm completed by staff, program participants, and volunteers. 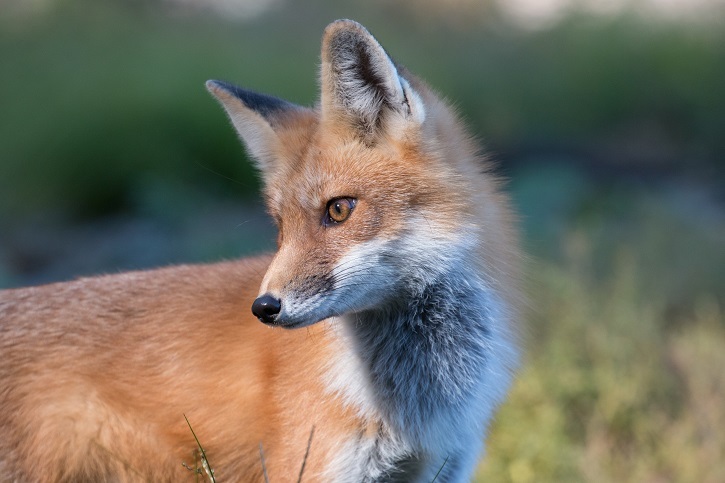 As a nonprofit, we rely heavily on the generosity of local volunteers who donate time, and funds, to maintain our crops, care for our animals, handle operational tasks, and more. 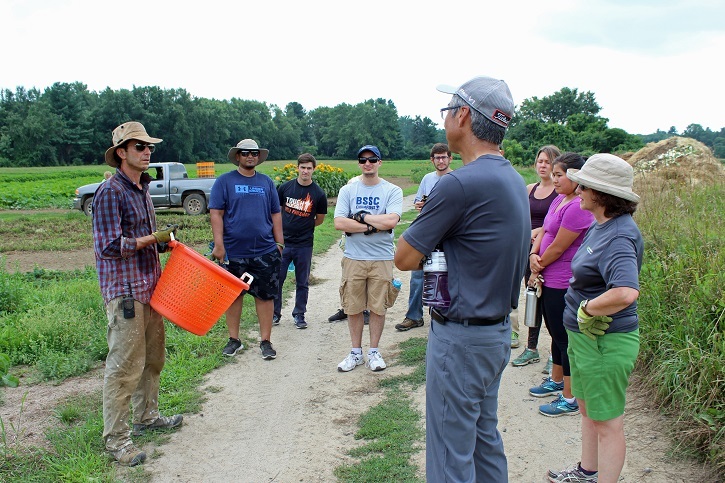 Last week, employees from Green International Affiliates, a civil and structural engineering firm based in Westford, visited the farm to learn more about what we do and lend a hand in the fields. 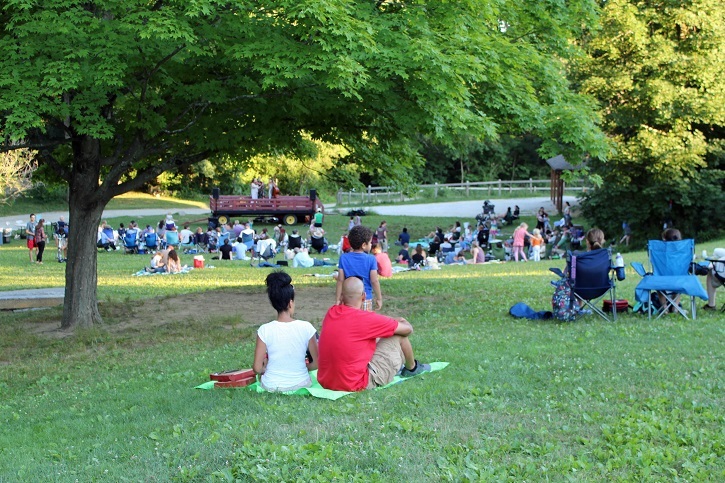 As a corporate member of our Community Partners Program, Green International employees receive memberships and passes to Drumlin Farm and opportunities to get more involved. 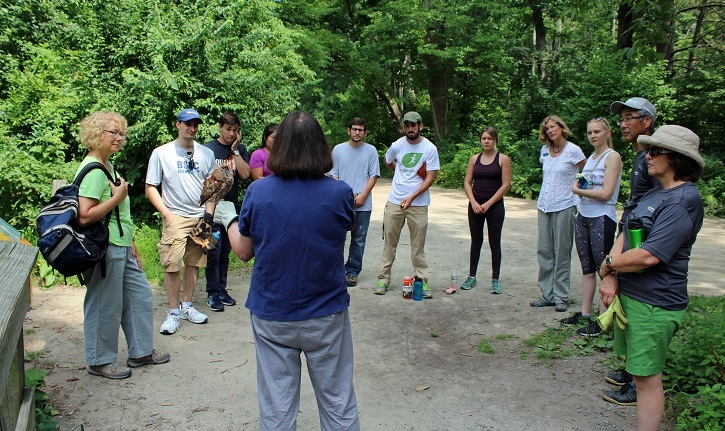 Sandy introduces Drumlin Farm’s screech owl to the volunteers. Their visit started off with a presentation by our educator Sandy and animal ambassador Screech Owl. Sandy introduced the small owl to the group and told them the remarkable story of its recovery. This owl was hit by a truck and lost vision in one eye, which deemed it non-releasable to the wild. Screech Owls can be found throughout Massachusetts, and have exceptional camouflage. This one has been a great help as an animal ambassador, teaching children and adults all about owl habits, life cycles, and ecological services. 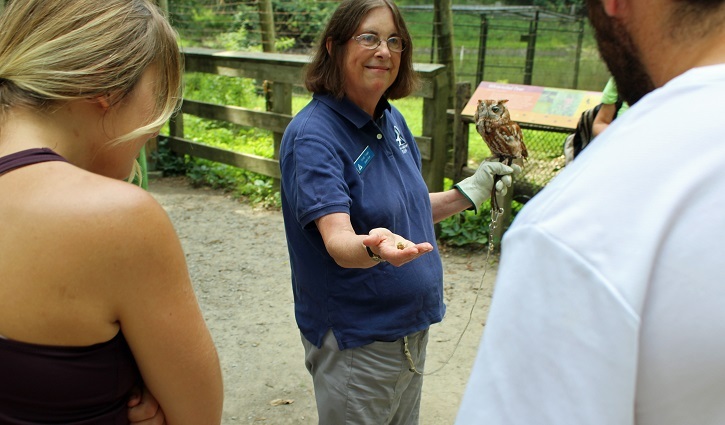 The volunteers were present for a special treat when the owl coughed up a pellet right in the middle of Sandy’s talk! Owls produce pellets as part of their digestion cycle and by studying them we can see what the animal has been eating. This lucky group got to see an owl pellet in the making. After the owl visit it was off to the field to meet Matt, our Crops Manager. 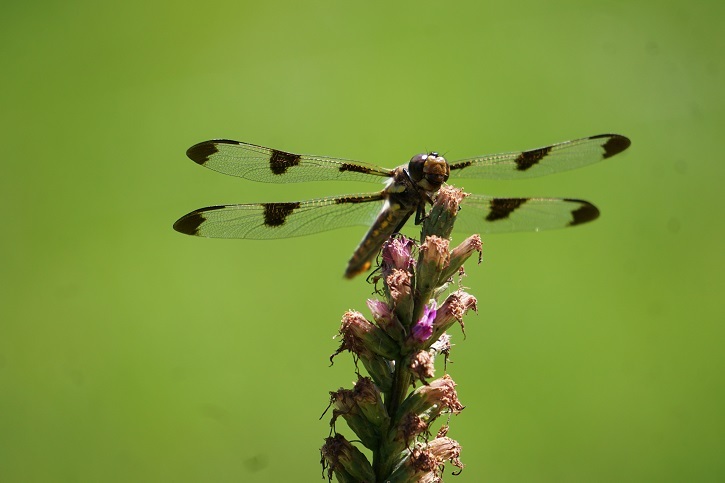 Matt provided a brief history of Drumlin Farm, including notable visits from Henry David Thoreau and a long tradition of using the land for agriculture and cropland, which makes our soil remarkably fertile. Matt explains to volunteers how they can help with weeding. Next, it was time to get down to work! Today, we needed to weed out the strawberry rows. Matt explained how weeds can take over an area if not properly removed and how to distinguish between them and smaller strawberry plants. Rain began to set in, but it was a cool break from the humid heat of the day and our volunteers grabbed a basket and got right to work. 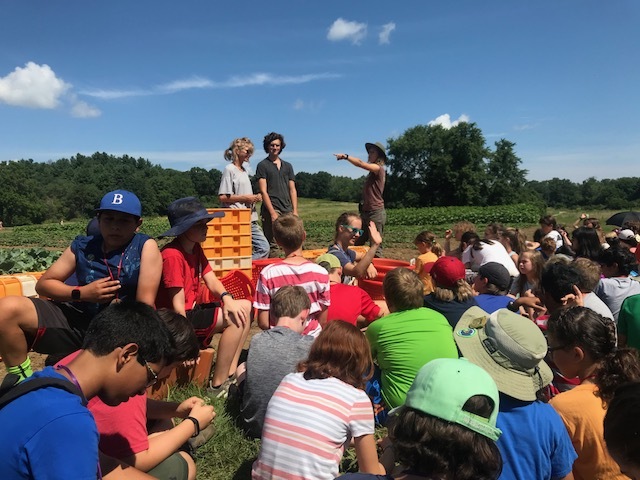 At the end of the day, the team weeded strawberries, planted 600 summer squash and 700 lettuce seedlings, and helped harvest tomatoes for the following day’s CSA distribution. Thanks to all at Green International for their help in furthering our mission to protect the nature of Massachusetts. Despite some rain, our volunteers welcomed the cool-down and started getting their hands dirty. Our Community Partners Program allows local businesses to give the gift of membership to their employees, as well as providing opportunities like those last week to get out of the office together, and work towards making our communities and environments more sustainable. 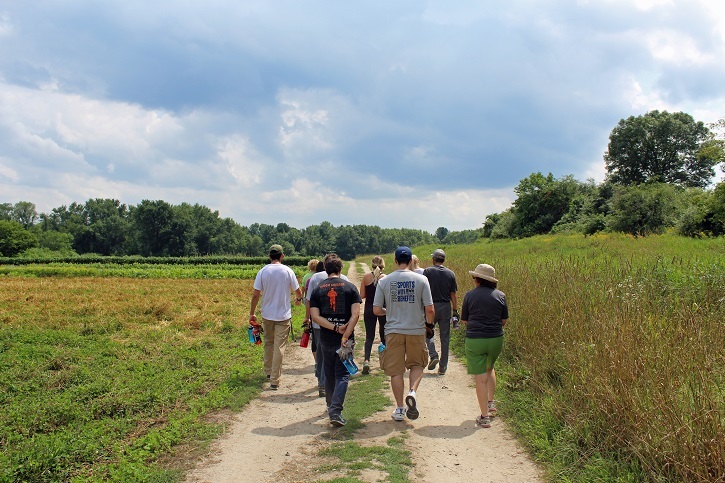 Volunteers walking the fields that have been used for cropland since America’s settlement. Thanks again to Green International Affiliates and all of our volunteers that continue to donate time and resources to the bettering of Massachusetts and the planet. See you next time! This entry was posted in Volunteers and tagged community partners program, crops, green international, help, screech owl, volunteers on August 16, 2018 by Kelly M..
Posted on August 15, 2018 by Kelly M.
“For the rain it raineth every day.” And we need it to stoppeth already before we contract trench foot kneeling in all these muddy puddles in our undrying boots! It’s wet and humid out there, and the fields are sodden, making it impossible to work the soil for seeding greens and fall cover crops. Cultivating by tractor or hoe is also impossible, so we’re inching along, pulling weeds out of the muck. But so far, the crops are thriving (along with the weeds), and we haven’t seen the foliar diseases often associated with wet weather: alternaria, and blight and downy mildew. Tomato ripening is speeding up, and today at the stand you’ll find heirlooms and cherries, and a super sale on specialty melons Snow Leopard and Sun Jewel. Rain and flooding impacted the last two Somerville markets causing a mid-market closure on August 4 and keeping attendance low again on August 11. Thanks to the Crops team for continuing their good work at market despite dreary conditions. Andrew preparing watermelons for market. 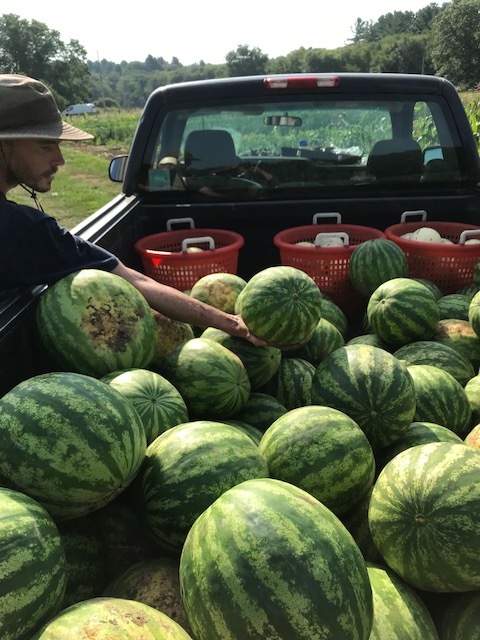 After Andrew finished loading watermelons onto the pickup truck in preparation for market, a two person team—a sprayer and a melon-turner—dance around the bed of the truck blasting mud from each fruit. Then, we drive the pickup to market that way, and the team bucket brigades the watermelons directly onto the display. Now we need some dry weather so people can come out and enjoy these delicious fruits! We also need dry weather to get back to spraying certified organic products for pest control. These pesticides need to remain on the leaves for several hours so that the target pest can ingest them. That won’t happen if a shower comes along and rinses them off. Right now, we’re most concerned about cabbage loopers on brassicas and bean beetles on string beans. Cambridge Institute hard at work. Two volunteer groups gave us a boost last week and managed to avoid getting rained on. On Tuesday, civil engineers from Green International weeded strawberries, planted squash and lettuce and helped harvest tomatoes for the following day’s CSA distribution. 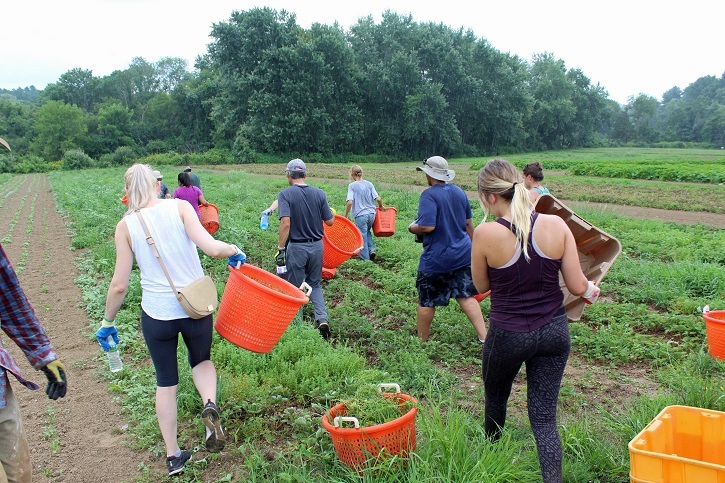 On Thursday, 40 employees of the Cambridge Innovation Institute picked beans and tomatoes, weeded leeks and harvested orange kabocha winter squash. Thanks all for the much-needed help! If we don’t turn into pillars of mold, we’ll see you in the field. This entry was posted in Farming and tagged crops update, csa, farm, local, sustainable, weekly on August 15, 2018 by Kelly M..
Posted on August 8, 2018 by Kelly M.
Ever seen a professionally groomed poodle metamorphose into a Neanderthal with a pronounced under bite? How about a presidential toupee served on a bed of angry marbles at sunset? No? Then I’m guessing you haven’t been out watching the shape-shifting clouds recently! Some years we remember as the year of the healthy tree, or the abundant rabbit, 100,000 fireflies, or the waterfall of eggplant, but with all these magnificent thunderstorms passing through, it’s definitely the year of the storm cloud, with theatres of transformation occurring at the cauliflowered edges. Of course, with all this heat and water, this is also the year of the weeds—in particular amaranth and purslane. 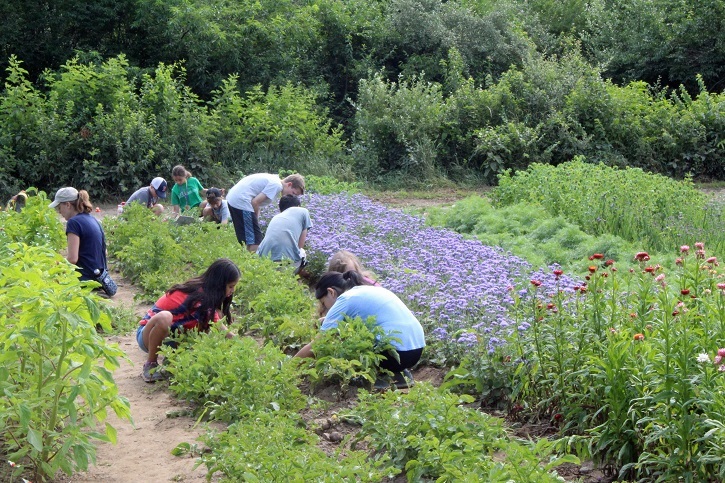 Last Tuesday morning, the Drumlin Farm campers and counselors did great work during the final Weed Out of the season. Check out these weedy scenes from before and after the campers arrive and thanks all for rescuing that round of brassicas. Before weed out, note the greenery growing in between the rows. Campers receiving instruction and learning about weeds and crops. Post camper-weed out. Looks amazing! That same afternoon, 30 internet security coders from IBM helped us finish 2018’s onion harvest. They also planted kale and broccoli, and weeded a quarter acre of strawberries. Thanks, IBM volunteers, for your outstanding work! 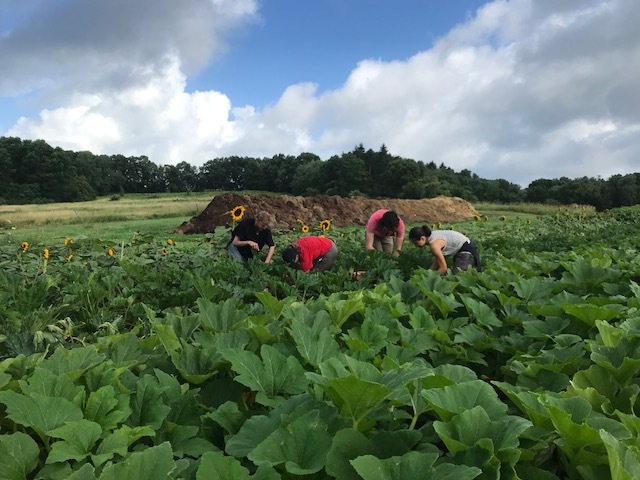 On Thursday of last week, 5 volunteers from the 1369 Coffeehouse returned for the fourth year to harvest the shallot crop, weed beets and melons, and harvest string beans for Saturday’s market. Thank you! IBM helping with the final onion harvest. With all the onions and garlic harvested and curing in the barn and the greenhouse, we can focus our attention on the tomato and melon harvest. Pink Berkeley Tie Dye, Indigo Cherry Drop and Sunrise Bumblebee are some of the new tomato varieties we’re trialing this year. Cantaloupe will be available all week, with Sun Jewel and Snow Leopard honeydews appearing as they ripen. Although fall is most definitely not in the air, we will begin harvesting spaghetti squash and orange kabocha winter squash later this week, hopefully before the deer decide to start taking bites out of them. Adirondack Red is the potato variety available at the stand and in the CSA share this week. It has red skin and pink flesh and is the perfect oblong shape for cutting into spears and roasting, enjoy! If you, your group or club, or you place of work would like to come and help in the fields with us, please email Pam Sowizral; if you’d like to learn more about our CSA and the upcoming opportunities to incorporate our produce into your meals, visit our web page. This entry was posted in Farming and tagged crops update, csa, farming, outdoor, produce on August 8, 2018 by Kelly M..
Posted on July 24, 2018 by Kelly M.
How about a chilled corn, fennel, cucumber and basil salad for dinner tonight? Or how about some spring onions and summer squash on the grill? All these goodies plus string beans and even the first few half-pints of husk cherries are available at the farm stand right now. The corn variety we are harvesting this week is a bi-color called Providence. It’s longer and narrower than Awesome, last week’s variety, and the taste is just as good. While we are saying goodbye to some team members and hiring others, several farmers have been working extra hours to fill in staffing gaps. Thanks all for the additional harvest hours this past Thursday and Friday evening, especially those that started at 5 am, making the last two restaurant harvests much more manageable. 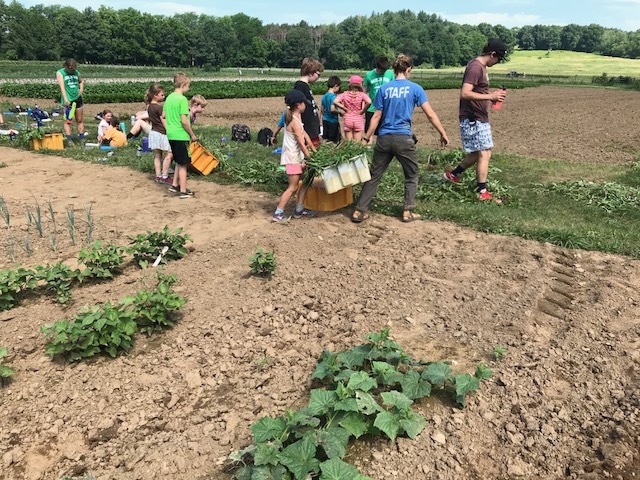 Campers and their camp counselors ran Weed Out #2 this past Tuesday, doing excellent work clearing weeds in the rhubarb and celeriac patches and in a bed of string beans and dahlias. This past Saturday, ten volunteers with the Appalachian Mountain Club helped us plant over 3,000 broccoli and kale seedlings. They also brought in the last 15 crates of Bridger onions and even helped us lug them up the stairs and into the barn loft for drying. Thanks for your help, AMC! We finished the garlic harvest last week thanks in part to help from new team members Natan Charytan and John Mark. Natan will be a junior at NYU in the fall, and John has recently moved to the area after working on food policy in NYC for the past several years. Thanks all for improvising with us as we figured out our new system for washing and clipping the garlic heads before spreading them on screens to dry. In a few weeks, we’ll taste the garlic to find out if this is a system worth replicating. This week we’ll be rescue-weeding the storage carrots and beets, transplanting storage cabbage, turnips and kohlrabi, and harvesting the first slicing tomatoes of the season. Watermelon and cantaloupe will be ready for picking any day now. With the harvests increasing in volume and duration, we are grateful to all those who are contributing now. If you’d like to taste the local difference and get weekly orders of our sustainable produce, our CSA is perfect for you! 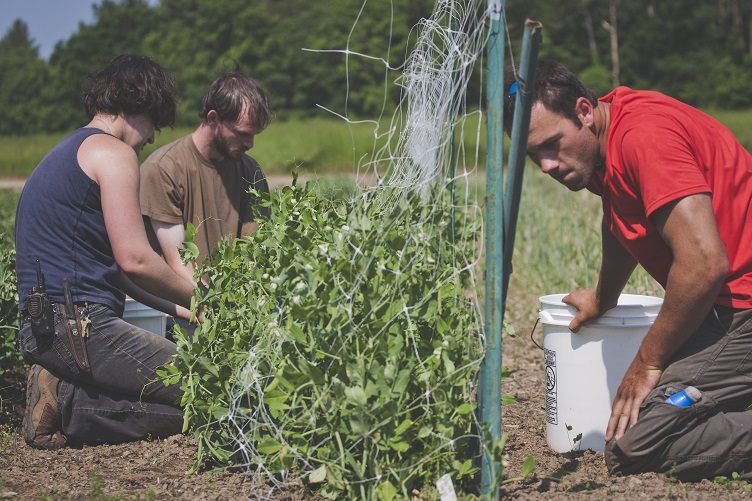 Those interested in joining the remainder of the summer CSA for a prorated rate can email our CSA Coordinator at vgassert@massaudubon.org. Those thinking ahead and eager for root crops and our Fall CSA can register today online or at Drumlin Farm. This entry was posted in Farming and tagged csa, farming, local, sustainable on July 24, 2018 by Kelly M..
Posted on July 18, 2018 by Kelly M.
Vampires beware! Our focus this week will be bringing in the garlic crop. We plan to use a power washer to remove dirt from the bulbs to save time on cleaning after the garlic has dried. Add our fresh garlic to your next homemade pizza night for a burst of fresh flavor! It’s also the start of our sweet corn season with the variety “Awesome” arriving at the stand and in the CSA share this week. Evidently, the taste lives up to the name! The storage onion harvest has also begun with 90% of the early variety “Bridger” already curing in the barn. Cherry tomatoes are beginning to color on the vines, and eggplant and pepper quantities are increasing to the point where we’ll soon have them available for you. Security is in need of beefing up around the watermelon patch as the coyotes are already scratching away at the fruits to see if they’re ripe! Campers learning about farming through hand-on projects, while helping to harvest! Last Friday, a group of campers harvested most of the green beans we sold at Saturday’s market. Thanks Emma for leading the campers! That same day, volunteers from the community harvested more beans, some peppers, the last of the fava beans and the cut flowers for our market display. We were short-handed that day, but the unexpected help made for a successful market. Last Tuesday, the second volunteer group of the season from Athena Capital helped us plant 2,600 broccoli plants and harvest potatoes. 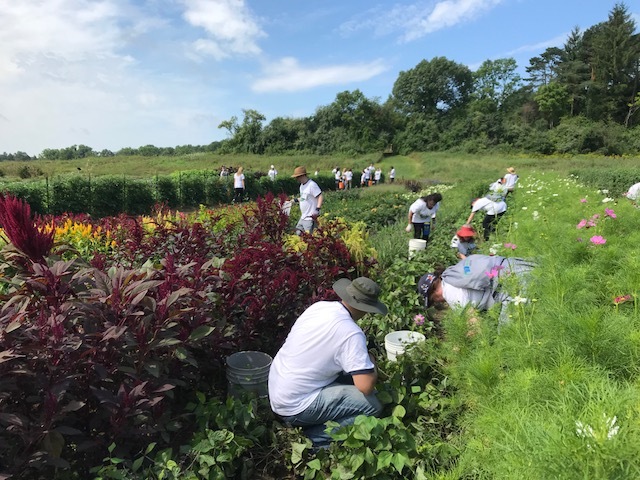 And on Thursday, volunteers from Needham software company PTC weeded strawberries, planted lettuce and sunflowers, and harvested potatoes and green garlic. What a pleasure it was to work with all these volunteers. Thank you! This entry was posted in Farming and tagged crops update, csa, farming, sustainable farming on July 18, 2018 by Kelly M..
Posted on July 10, 2018 by Kelly M.
And while it would be very annoying to find Williams’ apology in word magnets on your fridge on the morning you were anticipating plums, working in the glaring sun today made me appreciate his words in a new way—cold relief during a heatwave! While I haven’t had any cold plums lately, last Tuesday we received the equivalent in the form of help from all the campers during Weed Out #1. The heat index on that day was 108, but the counselors kept sprinkling the kids with water, and everyone did a great job clearing weeds from the leeks (pictured below). We got a boost from hearing the kids chattering and their music playing. On Thursday, again in the high heat, eight community volunteers helped us weed, plant cabbage and Brussels sprouts, and harvest potatoes for the first time this season. Look for Red Gold new potatoes at the farm stand and in your share. New potatoes are harvested when the plants are still alive and growing, unlike fall potatoes which are harvested after the top growth has died back and the potatoes have reached full size. New potatoes have very delicate skins that might flake off in the washing process. There’s no need to peel these tender spuds, and they are perfect in potato salad. On Thursday evening, we seeded half our crop of fall storage carrots in anticipation of Friday’s thunderstorm. Thankfully, it rained on the seeds and the temperature came down for a few days. On Saturday, we planted the second round of watermelons with four volunteers from the community. So, we keep pushing on with help from all sides: volunteers Anne, Sheila and Francesca have been coming in early to avoid the heat and keep us on schedule with greenhouse seeding; Fred has been helping us take down pea trellises and move electric fencing to protect our first round of sweet corn. This week we’ll be harvesting string beans, cucumbers, summer squash and spring onions. Peppers and eggplant are starting to bear fruit, which means tomatoes are not far off! If you’d like to join our Summer CSA mid-season please email CSA Coordinator Veronica Gassert at vgassert@massaudubon.org. 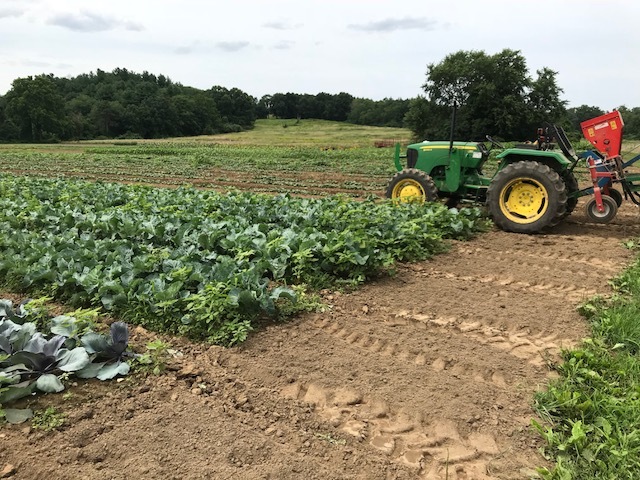 This entry was posted in Farming and tagged crops update, csa, farming on July 10, 2018 by Kelly M..
Posted on July 3, 2018 by Kelly M.
Storms on June 24 and 28 brought a total of almost 4 inches of rain to the fields last week! Crops and weeds are very happy right now with this hot weather on top of all that water. The wet conditions delayed transplanting and field work, but we finally finished planting the pumpkin patch on Sunday, and the next round of lettuce, basil, and scallions today. We are looking forward to Tuesday’s first Camp Weed Out, especially since last Thursday’s wash-out cancelled morning and afternoon corporate volunteer groups. We had originally been expecting 40 helpers that day, and so have been struggling to keep pace with the work. However on Tuesday of last week, good-humored planners from National Grid helped us plant cauliflower, pick peas, and weed onions. On Wednesday, volunteers from pharmaceutical company Alkermes, many of whom had helped us in the fields last year, planted 4,000 broccoli and cabbage seedlings before weeding onions and harvesting peas for the following day’s restaurant orders. Thanks everyone! Wheel hoeing the new carrot bed. We are beginning to harvest many summer favorites now. Look for summer squash, shelling peas, cucumbers, broccoli, spring onions, fava beans, celery and potatoes at the stand and in your share in the days ahead. Happy Fourth! This entry was posted in Farming and tagged crops update, csa, farmer on July 3, 2018 by Kelly M..
Posted on June 29, 2018 by Kelly M.
Looking at rainfall totals across the state from Sunday night’s storm, Lincoln was the winner with just over two inches! Not realizing just how much rain we got, we went out to the fields Monday morning hoping to transplant the second succession of tomatoes. However, we found standing water in the middle of some fields which made it too boggy to drive on with the tractor and transplanter. We satisfied ourselves pre-harvesting peas for Tuesday’s restaurant orders and catching up on some weeding. The Farm Ecologist camp group joined us in pulling weeds from around the new strawberry plants, which they had fun with. Before that heavy rain, generally dry and warm conditions had favored the strawberry crop. Now we will see a decline in quantities of berries, but this week will be the peak of pea season. 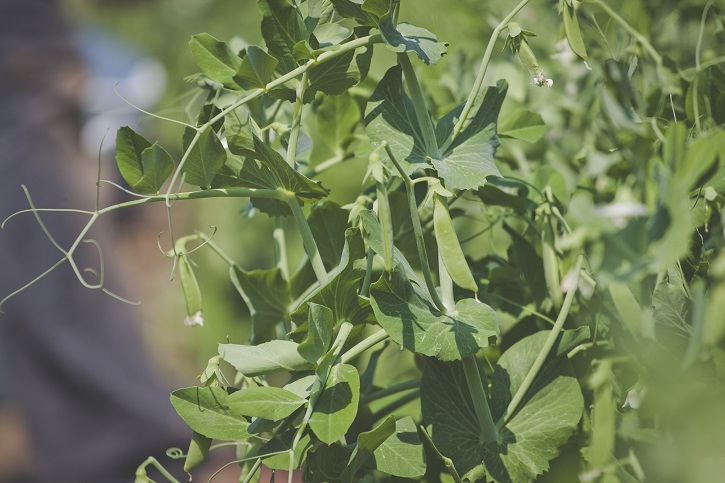 We are now harvesting sugar snap, shelling and snow peas, so keep an eye out for them at the stand and in your CSA share. This past Wednesday was the first distribution of the summer CSA, but it’s not too late to join! 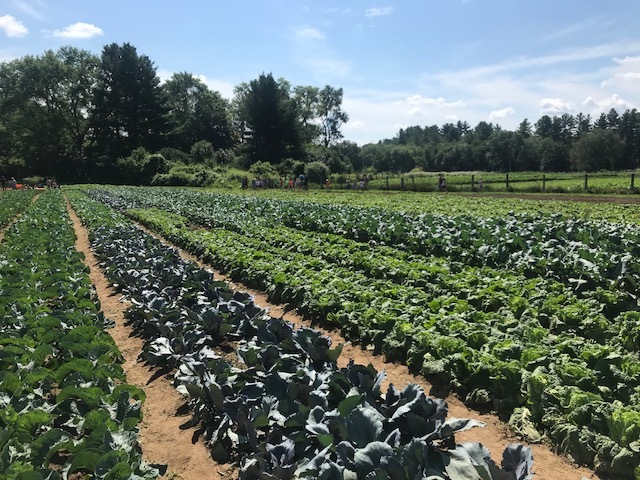 If you’re interested in registering for the CSA after it’s began, you can email our CSA Coordinator Veronica Gassert at vgassert@massaudubon.org for a pro-rated share, the summer CSA includes bountiful pickups every week until September 5. For the first time at Drumlin Farm, half-shares are available on a weekly basis as well, so if the fear of receiving too much food has prevented you from joining in the past, we have a great solution just for you. Carrots, beets, basil, peas, chard, garlic scapes, and spinach are some of the crops we plan to harvest for this week’s share. Scapes—the flower stalks of garlic—are, to this farmer’s mind, the greatest allium on earth. They are mild in flavor compared to garlic cloves, and have the consistency of firm pasta when cooked. If you cut it the right length, you have forest green penne. Delicious! Last week, we placed straw mulch around the first succession of tomatoes. The straw suppresses weeds, insulates the soil from drying out, and prevents mud from splashing up onto the plants during heavy rain which helps reduce instances of disease. When we plow the straw into the field in the fall, it adds organic matter to the soil—the key to holding water. Over the past two days, Sarah, Veronica and Andrew ran the first line of twine along the rows. In about four weeks, we’ll have placed another four lines of twine and reached the top of the stakes. Hopefully we’ll begin harvesting lots of tomatoes around that time. 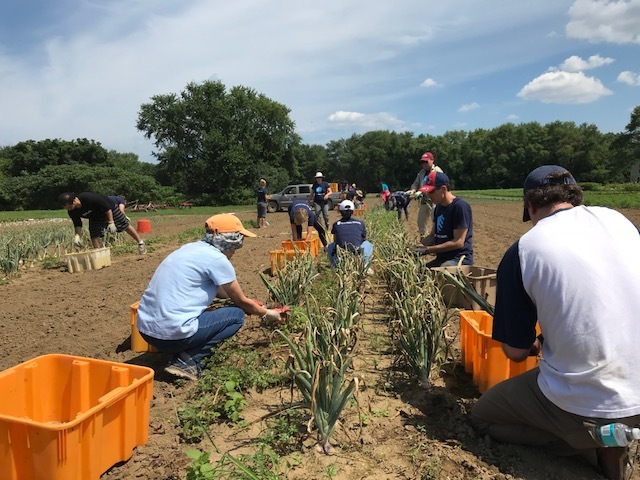 This past Thursday, we got help weeding onions and planting leeks from Athena Capital volunteers and from a surprise group of volunteers from the media company Nielsen—the more the merrier for those two labor-intensive jobs! On Tuesday, biostatisticians from Waltham’s LLX Solutions helped us plant the third and final round of sweet corn. Thanks, all, for pitching in and supporting the farm’s work. This entry was posted in Farming and tagged crops update, csa, farming on June 29, 2018 by Kelly M..